It was sad to leave Canada on Tuesday, but I was also excited to head back to Montana, a state that I immediately liked when I first arrived earlier in my trip. Back home in North Carolina a few weeks ago, I had sent a message to Last Chance Audubon in Helena about the possibility of observing Flammulated Owls. Webmaster Stephen Turner replied to my message. Not only would he take me to try for the owls, Stephen and his wife, Patty, invited me to stay at their house. I arrived at the Turner’s home about 3:30 PM, just enough time before dinner for Stephen to take me to look for Gray Partridge at a restricted access property owned by a local land trust. Two birds flushed from almost under our feet shortly after we started walking down the dirt path. It was too fast for a photo, but I did see the birds. That happened so quickly that we still had time for a quick trip to Mount Helena City Park. 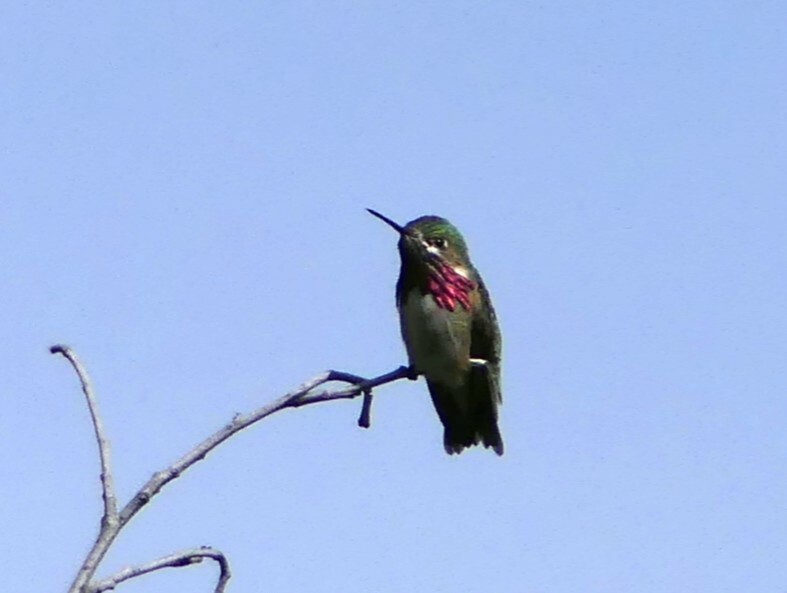 I got my life Calliope Hummingbird in North Carolina earlier this year, but I wanted to see an adult male and Stephen knew a spot. Just as promised, the little beauty was sitting on his favorite perch. He was just a little too far for good photos, but we did get great looks. Stephen’s birding buddy, Bob Martinka, joined us for a lovely dinner of Patty’s jambalaya, a wonderful change from road food. We headed out for more birding and went to the Flammulated Owl spot just as it was getting dark. 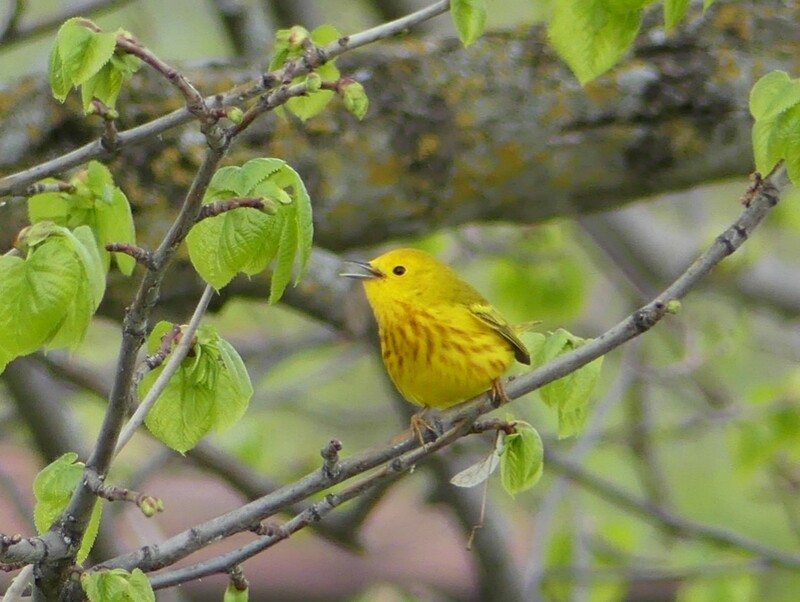 The birds are heard here every year, but previously they had not been reported before June. We were happy to hear two Flams calling as soon as it got dark. And, then another owl starting calling – Northern Pygmy-Owl. They had never heard it at that location before. What a fantastic surprise! One bird flew in to the tree right where we were standing. While we were not able to see the bird, it was exciting to hear it so close. The next morning Stephen and Bob took me out to look for Williamson’s and Red-naped Sapsuckers. 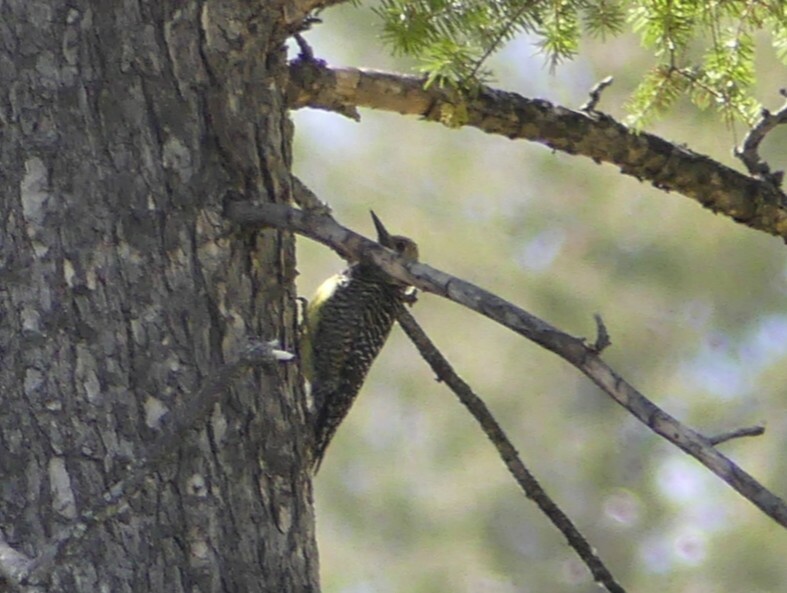 The Red-naped Sapsucker was supposed to be the easy bird of my targets in Helena, but we worked hard for both woodpeckers. 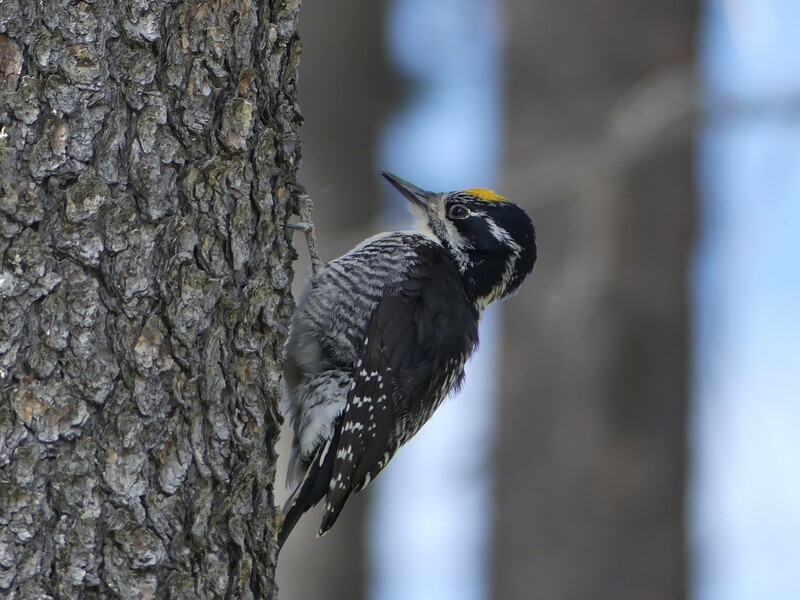 But, we did see both and I even got a photo of my life female Williamson’s Sapsucker. It’s a really bad photo, but special because it’s my lifer and, amazingly, I was even the first to see her. With help from Stephen and Bob, I had FIVE life birds in less than 24 hours! Birders talk about the importance of local knowledge and this proved it for me. I never would have found any of these birds without their help. They knew exactly where to go for each of these species. I am now stuck in Dillon, where I learned late yesterday afternoon what happens to the nice gravel roads when it rains. I drove to Bannack Bench Road to check it out and nearly got stuck in the glue-like muck. I had planned to spend the morning on that road, but more rain is forecast, so I’m looking for Plan B. It’s all part of the adventure! It’s about a 5-hour drive from Cypress Hills to Waterton Lakes, but I wanted to stop at Elkwater Lake in the West block of the provincial park, so I spent most of the day yesterday leisurely traveling. My GPS seems to have a preference for gravel roads. I was puzzled by some of her choices, but obeyed and had no complaints when she took me by a lovely little shallow lake by the side of the road soon after leaving the resort. The nice thing about dirt and gravel roads is that you can stop, so I pulled over when I saw the White Pelicans. Even though I had just seen them a few weeks ago in North Carolina, I couldn’t just drive by. The pelicans were joined by Western Grebes, several species of ducks, and, of course, Red-winged and Yellow-headed Blackbirds. These little lakes are magical surprises and one of the wonderful pleasures of driving the rural roads. Waterton Lakes National Park. The view from the entrance. 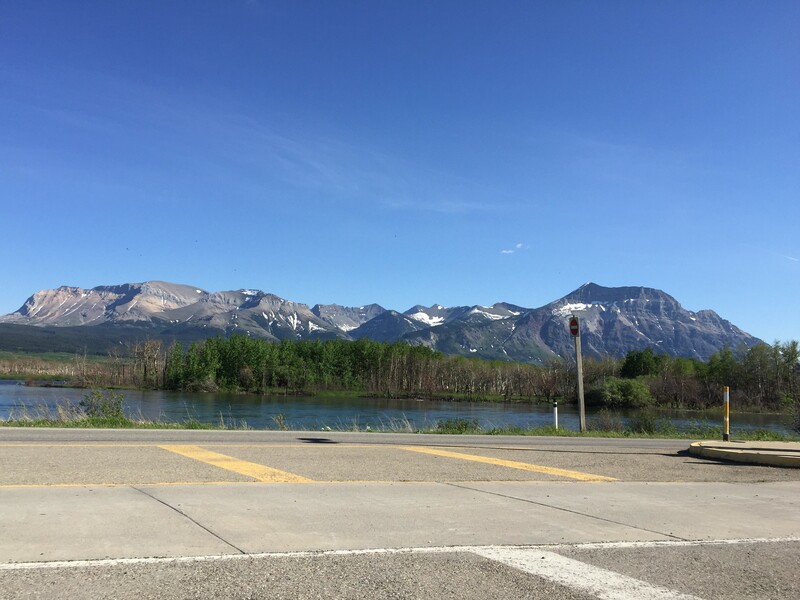 I arrived at Waterton Lakes National Park to learn that there were extensive fires here last year and, as a result, many of the roads and trails are still closed. This makes it unlikely that I would be able to find my target birds, Spruce and Dusky Grouse. So, without the pressure of finding life birds, I just enjoyed the birding and the spectacular scenery. 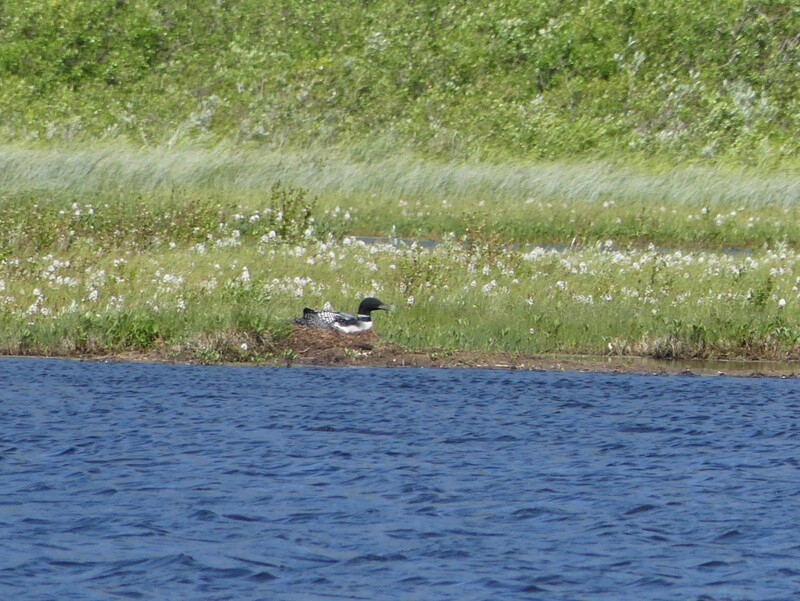 A Common Loon was on her nest at the entrance ponds. 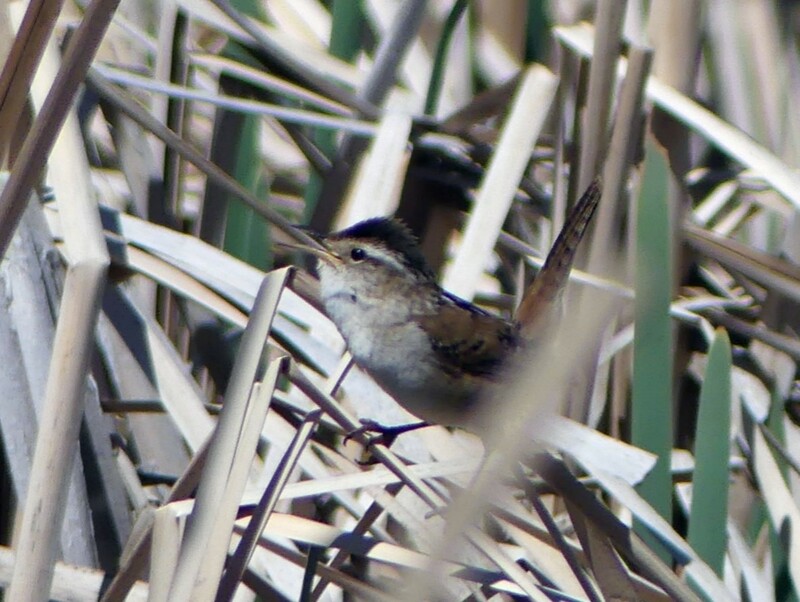 Marsh Wrens at the same location allowed me to take their photos, something that has never happened before today. I saw more pretty wildflowers on a walk this morning. 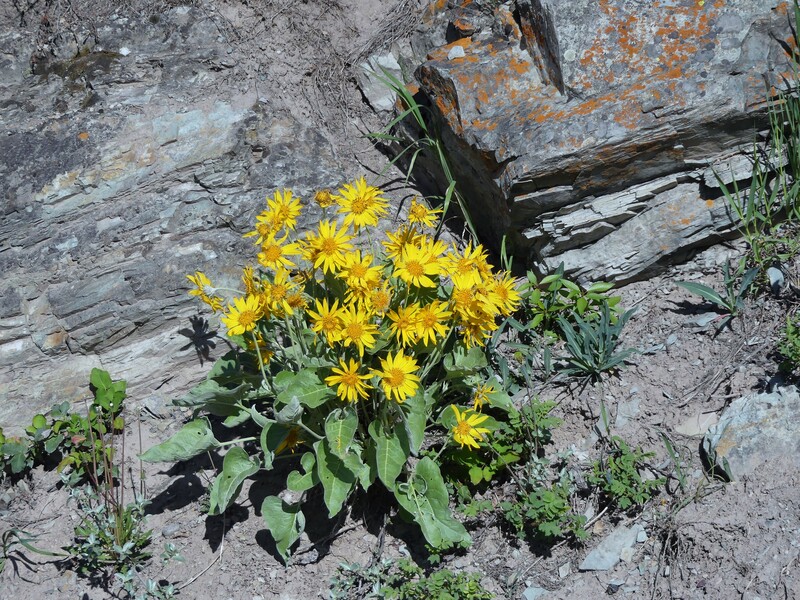 The flowers are getting more common as I go west, or as each day is closer to summer. I learned that the wildflower festival here is the middle of June, so it’s still a few weeks from peak bloom time. 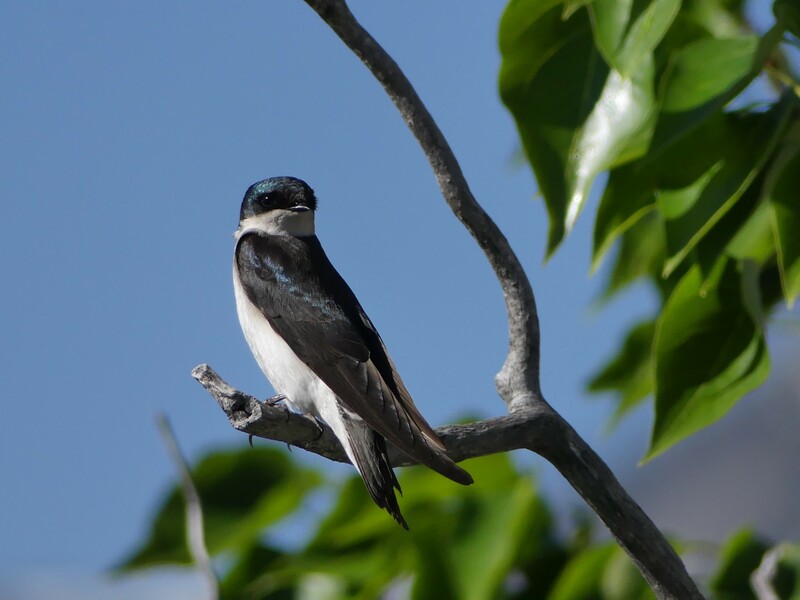 Tree Swallows are everywhere out here. And, I never get tired of them. I saw this pretty female on a beautiful walk this morning. But, my best sighting today was this guy, immediately identified by the owner of the motel where I am staying as “the 3-year old male.” He was just casually walking around the lake in town. I tried to keep a safe and respectful distance rather than try for the best photo. This is a black bear, but they have grizzly bears here, too. 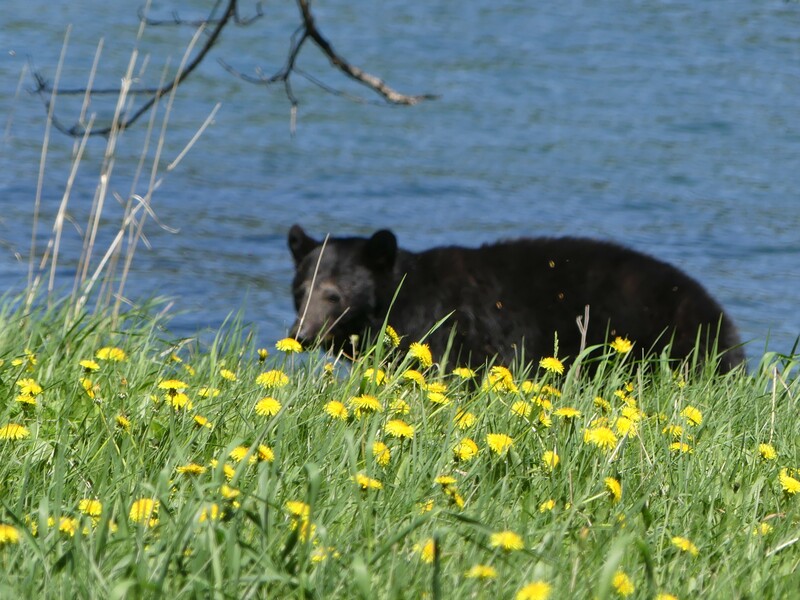 The three-year-old black bear casually walks around Waterton Lake. The past few days have been rather leisurely, but I am learning to pace myself. Every day cannot be an intensive birding day for 23 straight days. My time in Canada has gone too quickly and I have thoroughly enjoyed the birds, the landscape, and meeting some interesting and friendly people. Tomorrow I head back to Montana where more birds and adventures await. Well, friends, I knew it would happen some time. I just accidentally hit an unknown shortcut key and published a post with only one sentence. I apologize for any confusion. So, back to my story… I left The Crossing at Grasslands in Val Marie late in the morning on Thursday, May 24. It could have been a short 2-1/2 hour drive to Cypress Hills, but I detoured to Eastend to look for Prairie Falcon, which would be a sure thing at Jones Peak (yeah, right). It was another of those long dirt and gravel roads, but it did lead up and up to a spectacular view of the valley below. I believe that Prairie Falcons do breed there, but I should have known by the zero photos in eBird for that location that not many people get a really good look. It was so windy that I could barely keep myself upright. I did not set up the scope because I knew it would blow over. 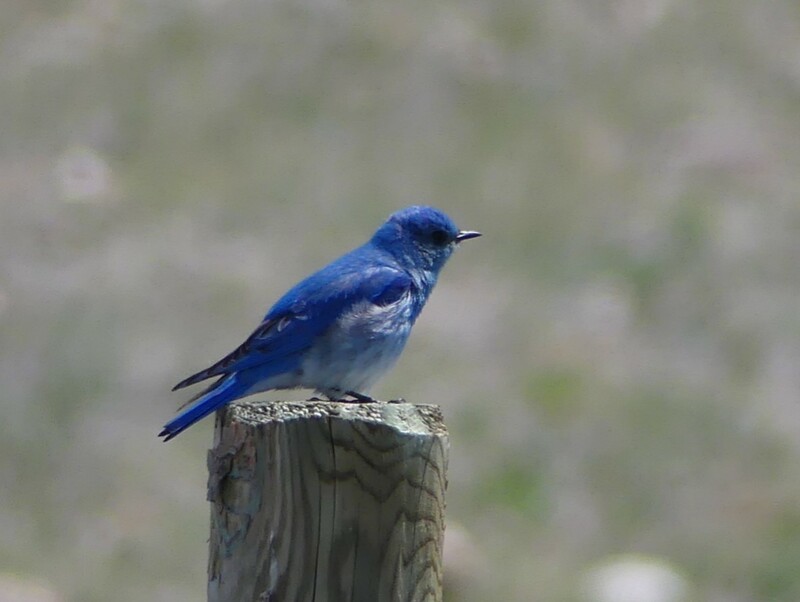 So, I did not add Prairie Falcon to my life list, but I did see some pretty Tree Swallows and Mountain Bluebirds. I arrived at The Resort at Cypress Hills that afternoon and walked around the lake before settling in for the night. The park is beautiful and the trees are a lovely change from the prairie. However, I headed out to the prairie again the next morning. On Friday, I drove over 1-1/2 hours towards Wild Horse, Alberta, to look for McCown’s Longspur again. I loved the first 11 miles of the gravel road and did not encounter another vehicle. Nor did I encounter any McCown’s Longspurs. 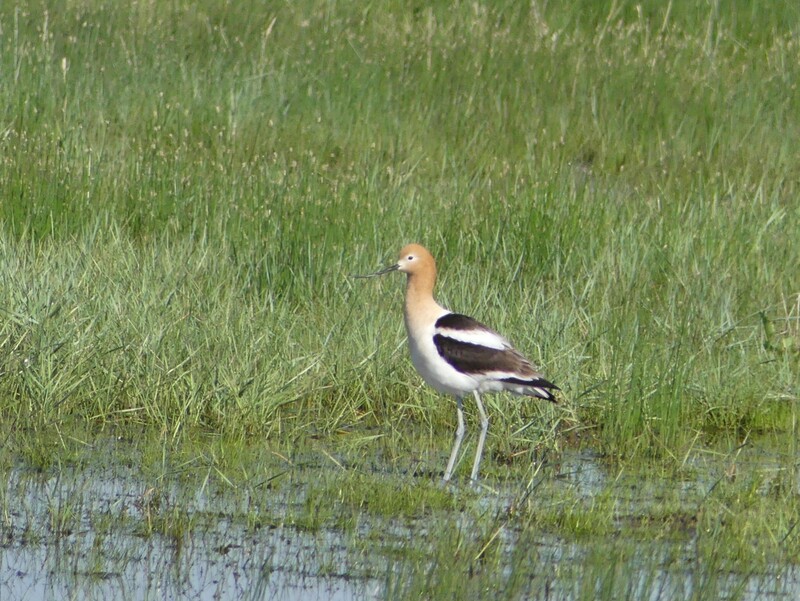 I did, however, see a few American Avocets in breeding plumage, the color of dreamsicles, a friend used to say. The next 10 miles were pretty good, too, and I met another birder coming from the opposite direction. 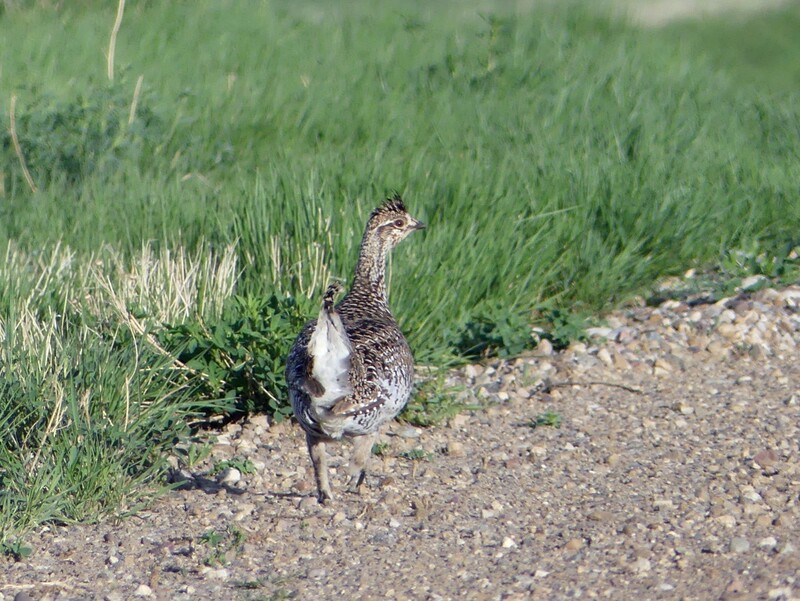 He greeted me with “What do you need?” I replied, “McCown’s Longspur.” “I just pushed three of them your way. Just wait here five minutes and they will be here.” Well, we talked 10 or 15 minutes and another truck came by. Birds don’t always keep hopping straight down the road, either, so I missed them. I continued on down the road and was at the border station before I realized that my target road had ended. It was good fortune, though, because they have rest rooms at the border station (travel tip). 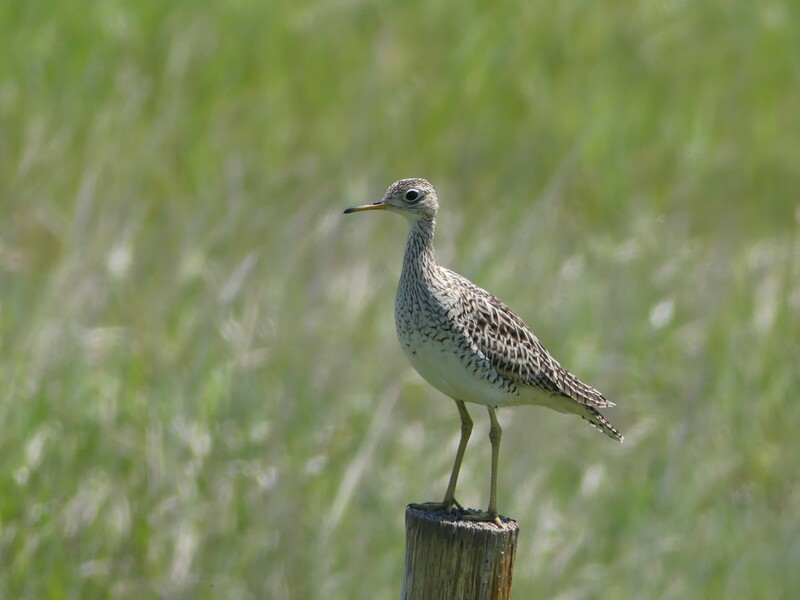 Plus, I found the most cooperative Upland Sandpiper just before the end of the road. I think this bird would have let me look at him all day. I could have made a loop back to Cypress Hills, but I liked the first 11 miles of the road I was on so much that I decided to return the same way. I don’t know what changed, other than my luck, but I found EIGHT adult male McCown’s Longspurs on the way back! My mediocre photos make me happy, proof that I finally found these little beauties. 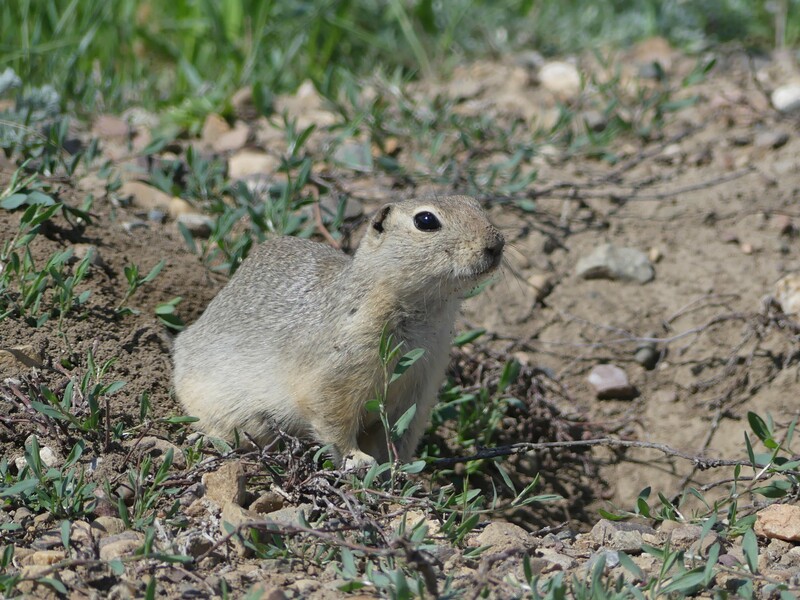 Yesterday’s mammal of the day is Richardson’s ground squirrel. Today’s highlight happened when I went out to get in my car. 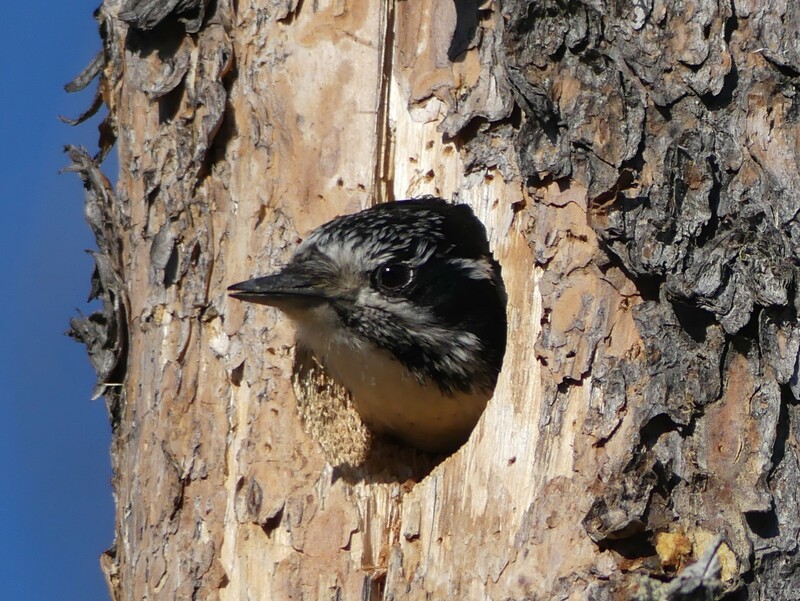 Yesterday, I had discovered a woodpecker nest on the edge of the parking lot and got a photo of a nestling poking his head out of the hole. I suspected it was a Three-toed Woodpecker, but I wasn’t sure. Today, I saw Papa Three-toe leave the nest and fly to a close tree, where he preened for five minutes. It was such a privilege to watch these birds, a species that I have not seen often. I drove to the West Block of the park, over the roughest gravel roads yet. I did not see a lot of birds there, but did enjoy the scenery and had a nice walk. I finally saw the first significant prairie flowers of the trip. 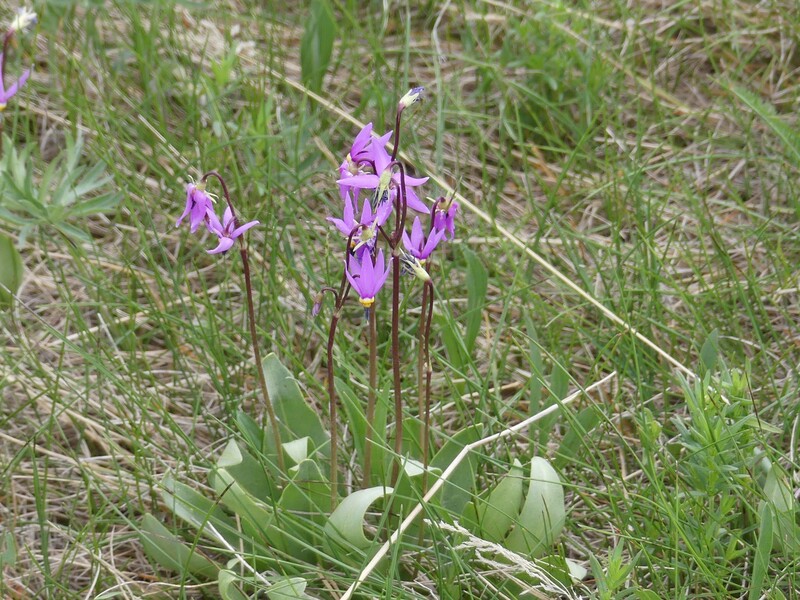 Update: One of the two Shooting Stars native to Saskatchewan, genus Dodecatheon, but I did not measure the leaves or petals, so cannot determine which species. On the way back, I stopped on the side of the road to watch a Golden Eagle. Another raptor was attacking it, so I started taking photos. 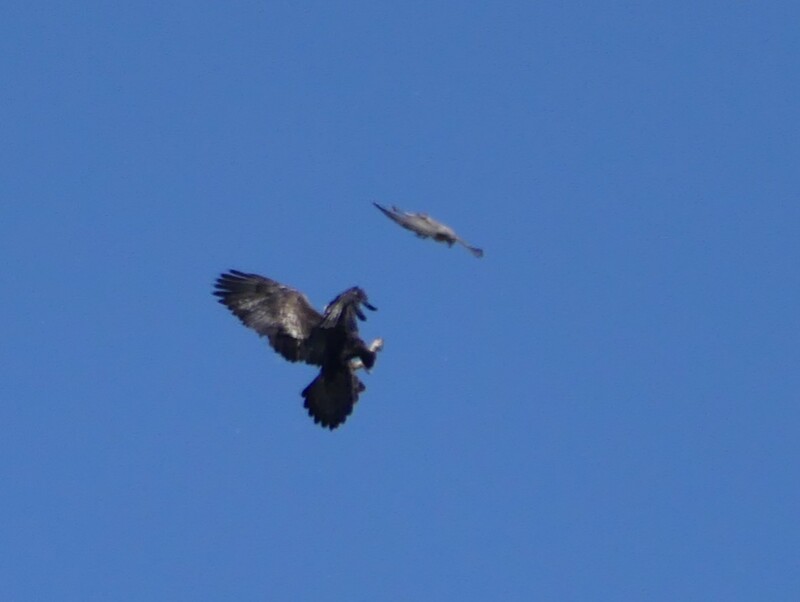 When I looked at them, I realized that the eagle had stolen the Swainson’s Hawk’s lunch. There is nothing like a little raptor drama to liven up the day. Today’s mammal was this red squirrel who did not want me to take his picture. He didn’t even want me in his woods. Tomorrow, I’m on the road again, heading to Waterton Lake National Park. Grasslands National Park is one of the quietest places in North America. The peace and beauty of this place for the past three and a half days has been wonderful. 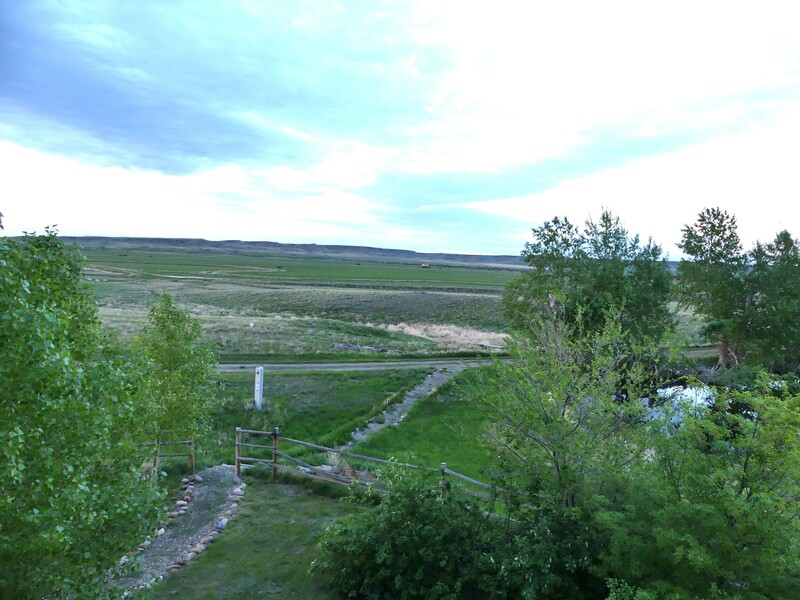 I am staying at The Crossing at Grasslands, which is adjacent to the park. Here is the view from my balcony. The other direction overlooks a little pond with ducks and Wilson’s Phalaropes. My most important target bird here was Baird’s Sparrow, so I looked up the locations within the park where it had been reported in eBird. On Monday morning, I headed to the closest of those locations, the road to Two Trees. I heard it singing as I slowly drove the road, so I got a recording, but I wanted to see the little sparrow. However, I felt intimidated by the huge grassy area with no landmarks and even with my scope, I could not find the bird. Plus, I was distracted by the mosquitoes that swarmed all around. I figured it might just have to join Black Rail on my life list as a heard-only bird. I continued with my day and the ecotour drive. The next morning, I was more determined and confident about finding the Baird’s Sparrow. I decided that it made the most sense to go back to where I had heard it. It had to be there and it was close to where I was staying. I went back to the road before breakfast to look for the sparrow. Again, I heard it. And, then I saw it. I got a good look with the scope and then slowly walked into the field a few feet at a time. The sparrow flitted from one bunch of grass to another, but I was able to keep track of him. Finding my own Baird’s Sparrow was one of the highlights of my birding life and I will never forget that beautiful morning on the prairie. The rest of my time here is a jumble of birds and other wildlife, quiet and solitude, peace, and gorgeous scenery. I was frequently alone on hikes or at stops along the roads. But, when I have met others, everyone has been exceptionally friendly. If birding can be a vacation, this is it. I certainly was getting practice with common sparrows, like Vesper. They were so numerous in spots that I worried I would hit one with the car. Like the pretty little Horned Larks, they like to hop down the road in front of the car, staying just a few feet ahead. 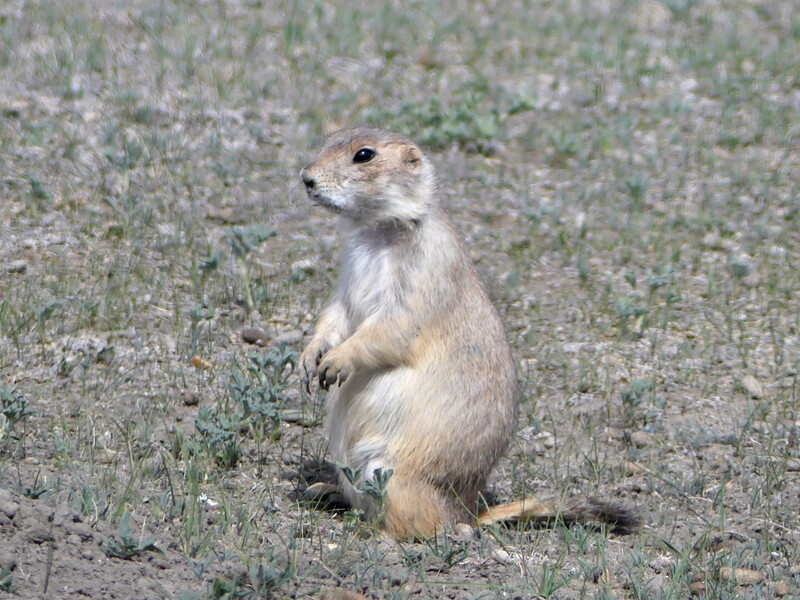 Black-tailed prairie dogs were fun to see and I counted at least 30 at the dog town. 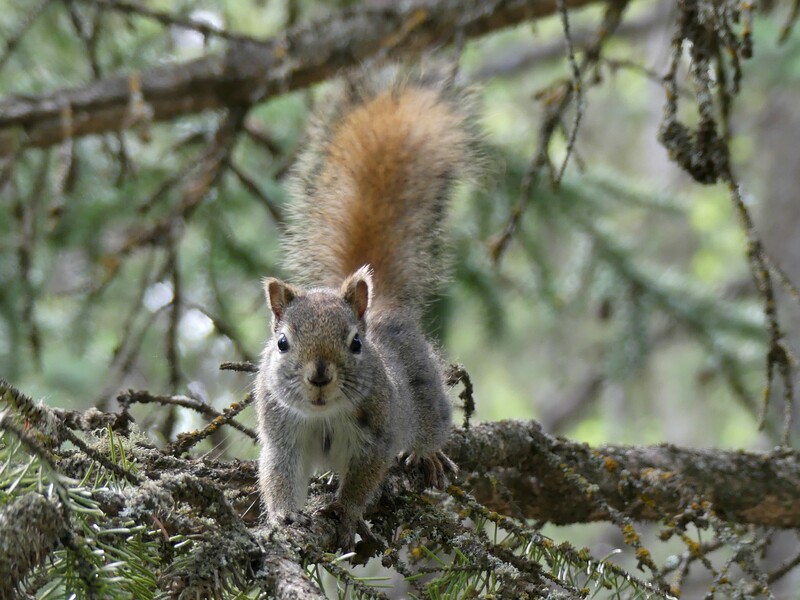 While their conservation is secure in the U.S., they are threatened in Canada and the government is taking steps to protect them. 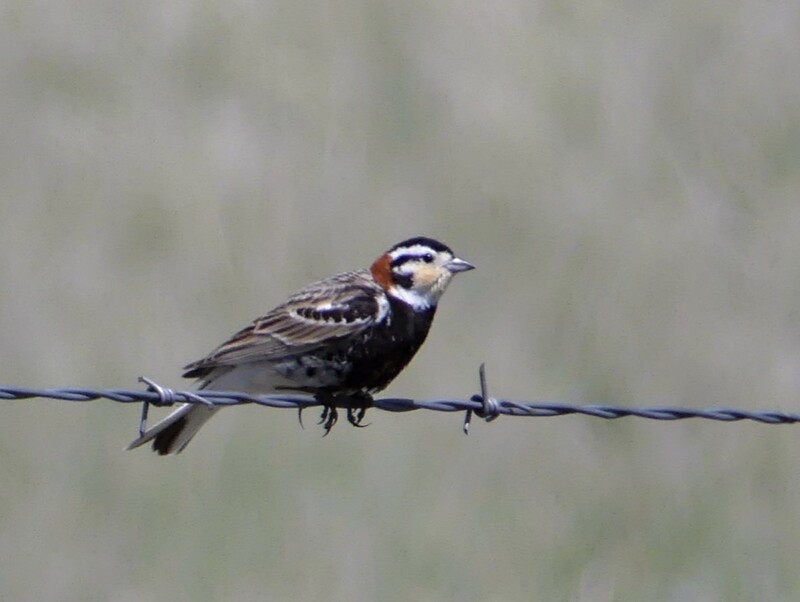 I was also pleased to see a couple of beautiful Chestnut-collared Longspurs on the ecotour drive. 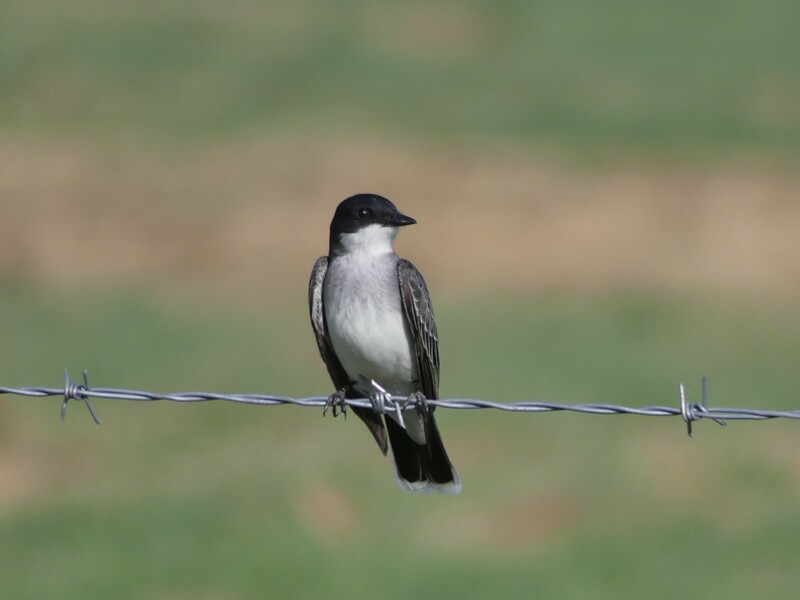 Eastern Kingbirds are everywhere; they are much more abundant here than at home. This morning, I even had a pair on my windowsill. A Western Kingbird was the first bird that I saw after I crossed the border, but I have seen very few since then. 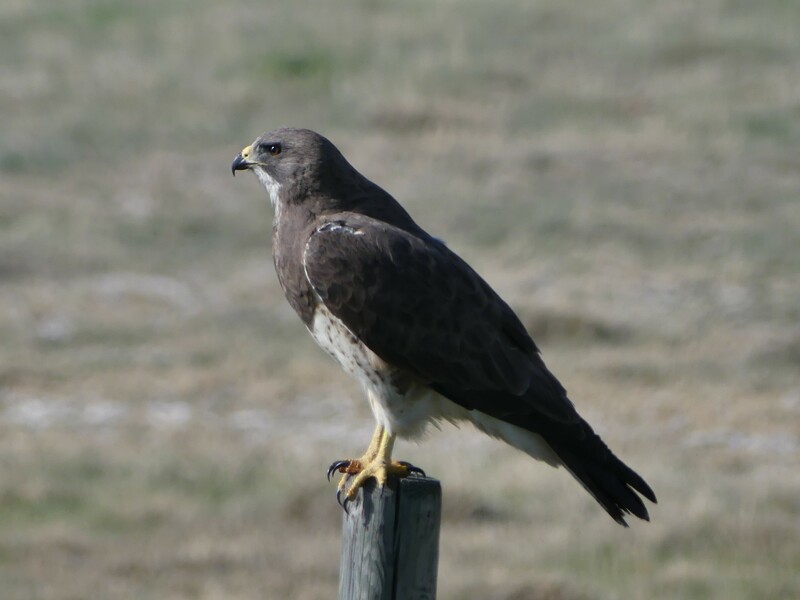 Swainson’s Hawks are fairly common here, too, and surprisingly they do not always flush from fence posts when I stop. 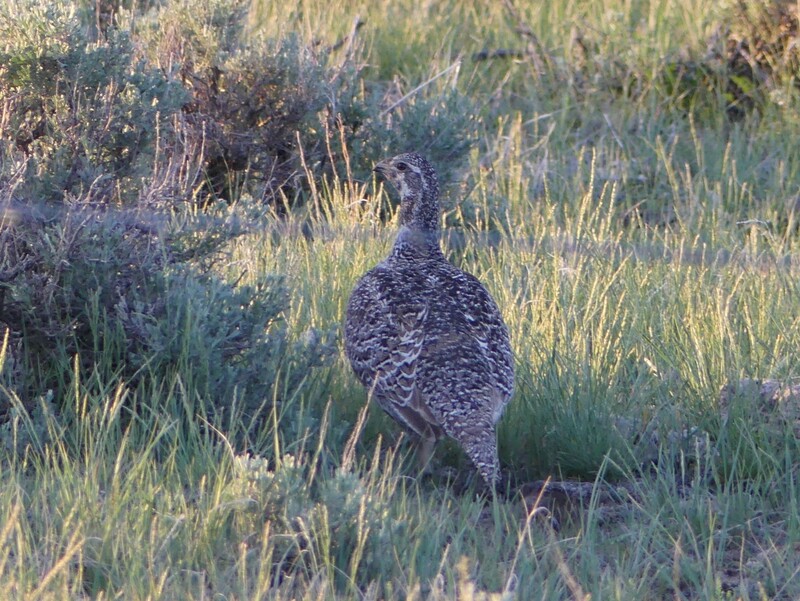 Sharp-tailed Grouse seem to be easy to find. Here is the second or third that I’ve seen so far on this trip. It has been wonderful to have a few days to relax and be a little lazy after pushing so hard at the start of the trip. I had hoped to find Sprague’s Pipit and McCown’s Longspur here, too, but it wasn’t meant to be. The longspur doesn’t appear to be as common as I’d hoped and I think that the pipit could turn into a nemesis bird for me. The combination of my poor vision and hearing and desire to actually SEE the bird, field marks and all, before counting it makes it challenging. However, I have more opportunities for both still on this trip. Tomorrow I head to another Canada park, Cypress Hills Provincial Park. I left Minot yesterday morning and headed to Lostwood NWR as planned. I loved the quiet and solitude of the gently rolling grasslands. I did not see anyone on the entire 8-mile wildlife drive. The only sounds were birds and the gentle breeze. I didn’t see anything unusual there, but I am enjoying the common western birds. 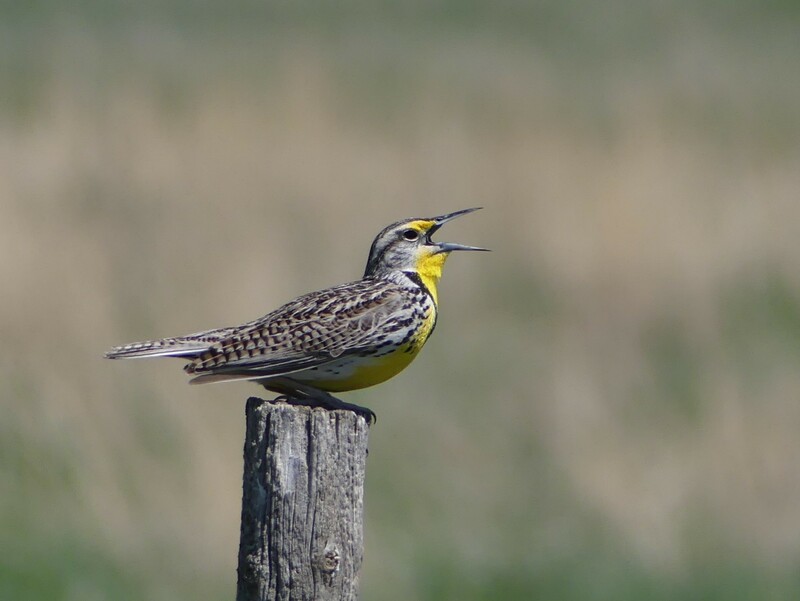 Meadowlarks are everywhere and they seem to sing non-stop. After Lostwood, my day did not go as planned because I could not resist more birding. 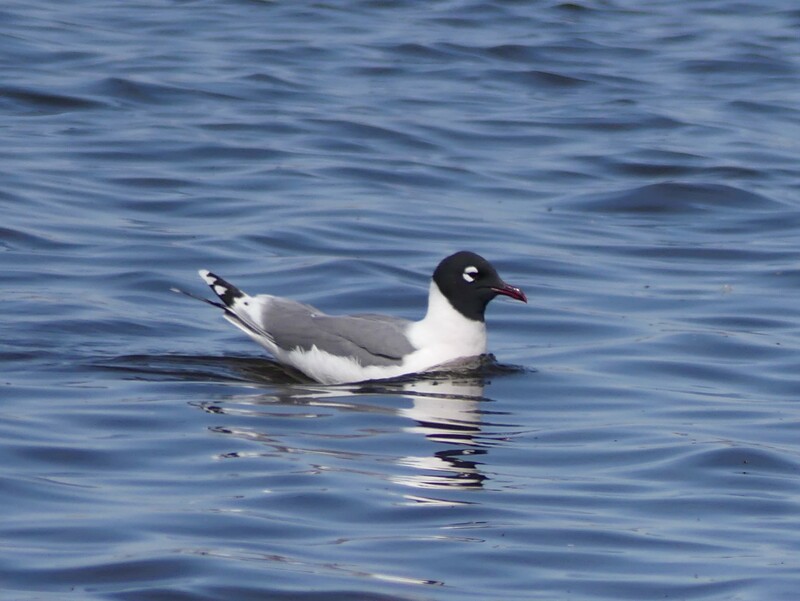 I soon saw a little lake on the side of the road with 150 Franklin’s Gulls. How could I not stop for these beauties? Many had the beautiful pink blush of fresh breeding plumage and all were gorgeous. This little lake also contained about 100 Ring-billed Gulls, ducks, grebes, and phalaropes. 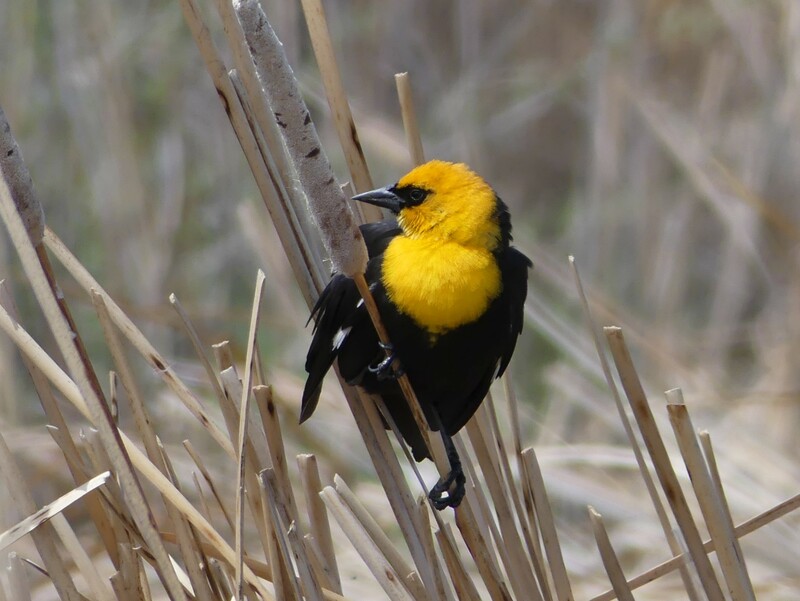 Yellow-headed Blackbirds were busy singing and nest building on the side of the lake closest to where I stood. And, none of the birds seemed to mind my presence at all. The weather was absolutely perfect, sunny and just the right temperature. It was one of those magic moments and I could have stayed there forever. So, now I was behind schedule and I really needed to drive to Glasgow, Montana. But, no. I passed the entrance to Medicine Lake NWR and I just could not drive by without doing another 9-mile wildlife drive. Again, I did not see anything unusual, but it was enjoyable. This time I saw one other vehicle on the drive. 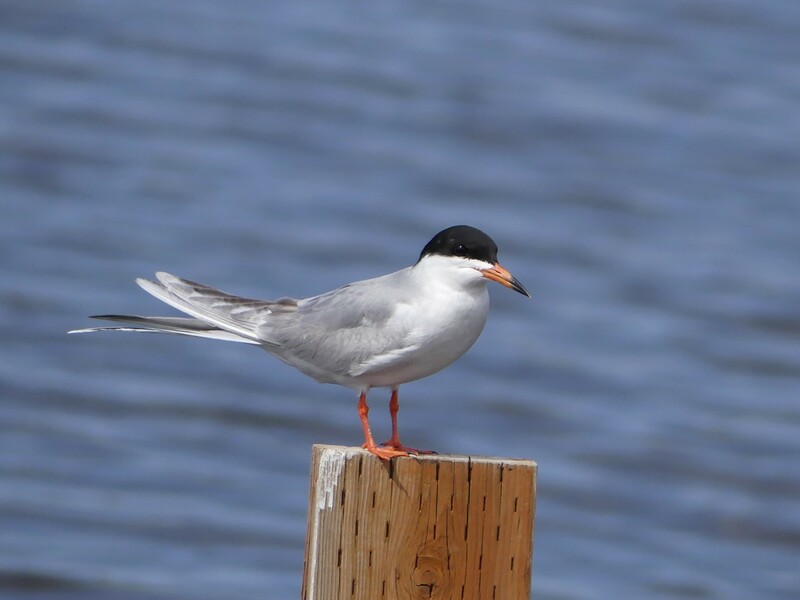 It was fun to see a bird in breeding plumage that I usually see only in winter, Forster’s Tern, right by the side of the road. It was turning out to be a long day, but I was determined to check out Bentonite Road outside of Glasgow when I arrived. This would be my best opportunity for Mountain Plover and I wanted two chances to drive the road. It was 7:15 PM when I started down the rough gravel road. And, I would have to drive 17 miles on this road to get to the first place that the plovers are usually seen. It was difficult to even be sure that I was on the right road, but I managed to do it. 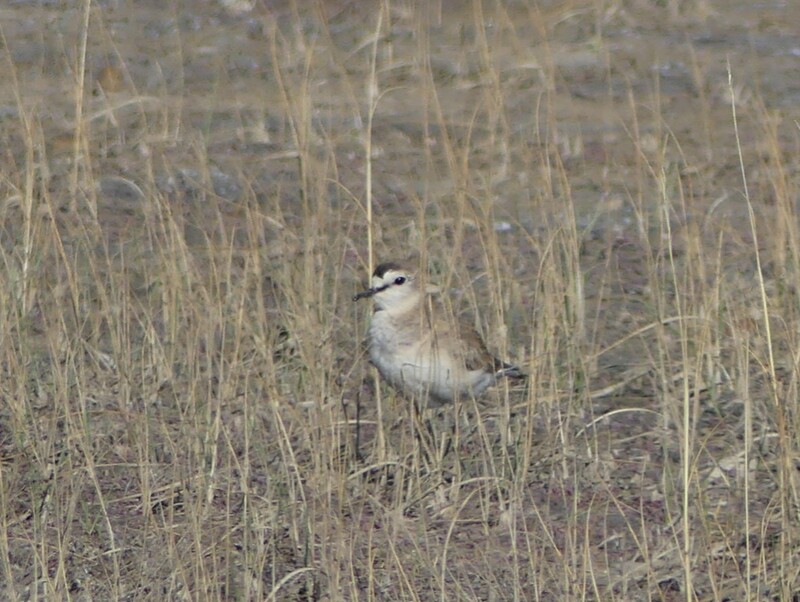 And, just at mile 17, a lovely, graceful Mountain Plover flew in close to the side of the road. I had a great look and then he was gone. I drove another mile and then turned around, hoping to be back at the hotel by dark. I was thrilled to have seen the plover on my first attempt, but my luck for the day was not over yet. 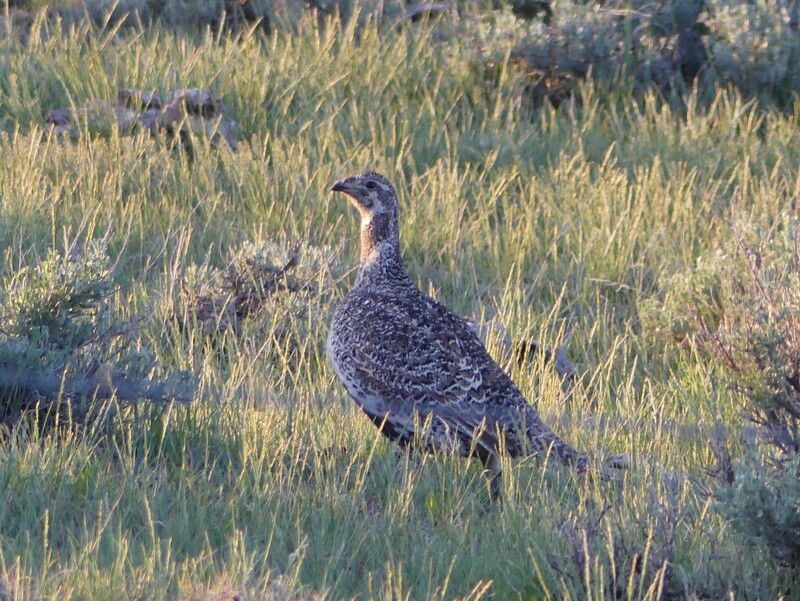 While hurrying to get back, I flushed a female Greater Sage-Grouse from the side of the road. She flew just a little way and then froze, so I got photos. 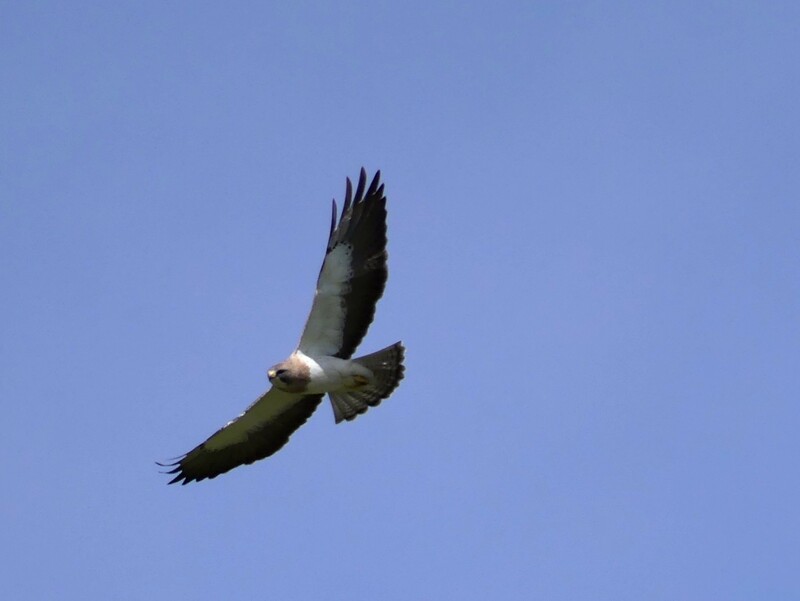 This was another bird on my most wanted list and I could not believe my luck in getting it right away. Just as I was almost back to town, I saw a pair of Ring-necked Pheasants right on the road. What a day! I fell into bed very tired and very happy. This morning, I drove Bentonite Road again and saw two plovers today. This time, I got photos. Wilson’s Phalaropes are very common out here I enjoyed close of views of several on my way back to the hotel. 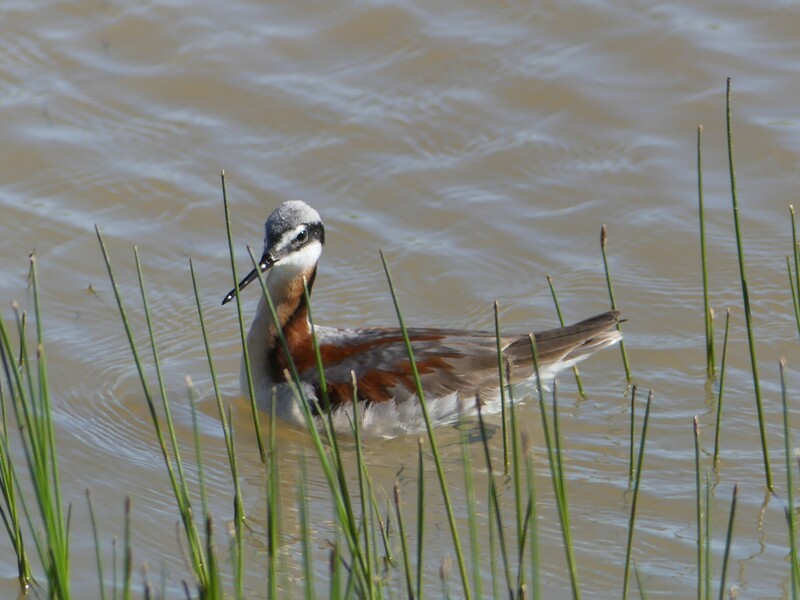 Like all phalaropes, the females are the pretty ones. I checked out of my Glasgow hotel at 11:00 AM this morning and drove north to Canada. After crossing the border, I drove through the East Block of Grasslands National Park over to the west side, where I am staying. 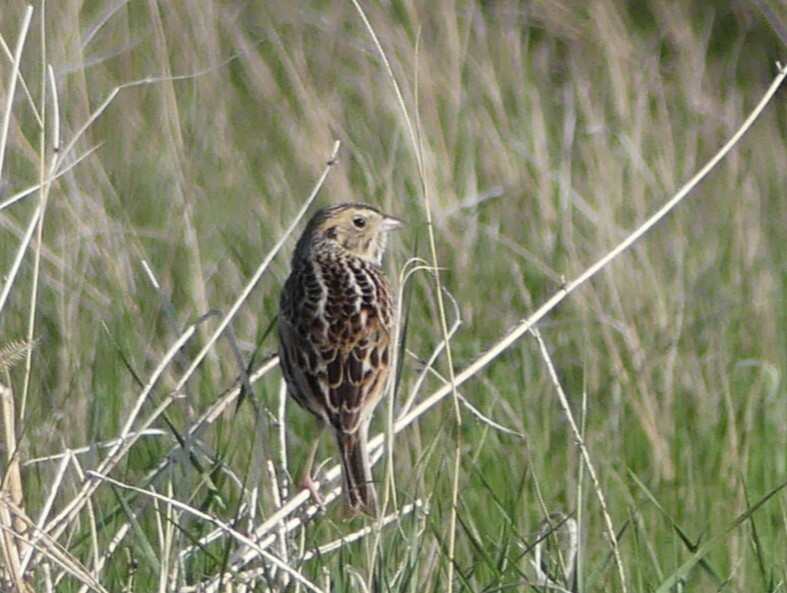 My targets here may prove more challenging – Sprague’s Pipit and Baird’s Sparrow. The birds are plentiful here, but not easy to find. 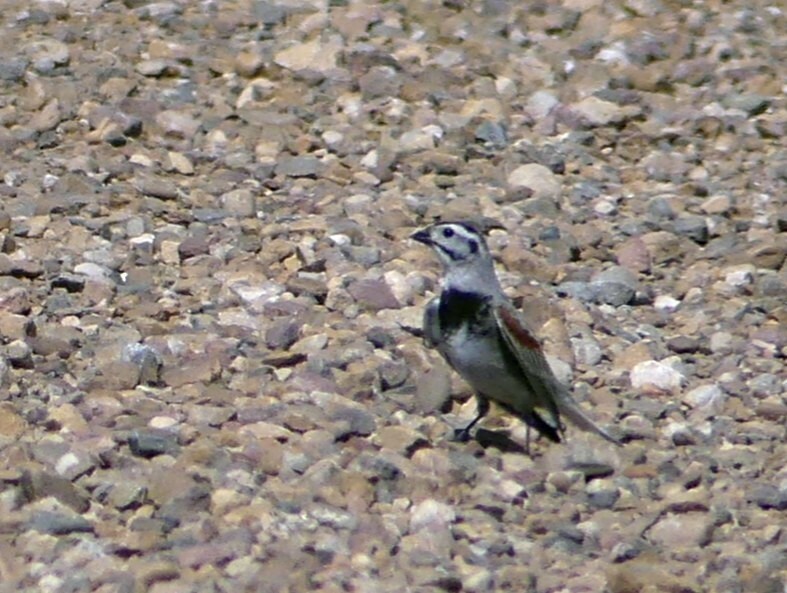 Also, McCown’s Longspur was not as easy as I’d hoped, so I need to find it here also. But, I will be here for four nights and I am sure that I will enjoy my time, whether I get my target birds or not. What will I see here? US-2 turned out to be a four-lane divided highway most of the way rather than the quiet two-lane road that I had expected. However, this gave it one big advantage – rest areas. A little while after leaving Grand Rapids, I saw the first rest area and stopped. I planned to use the restroom and just take a quick look around. But as soon as I opened my car door, I heard birdsong fill the air. 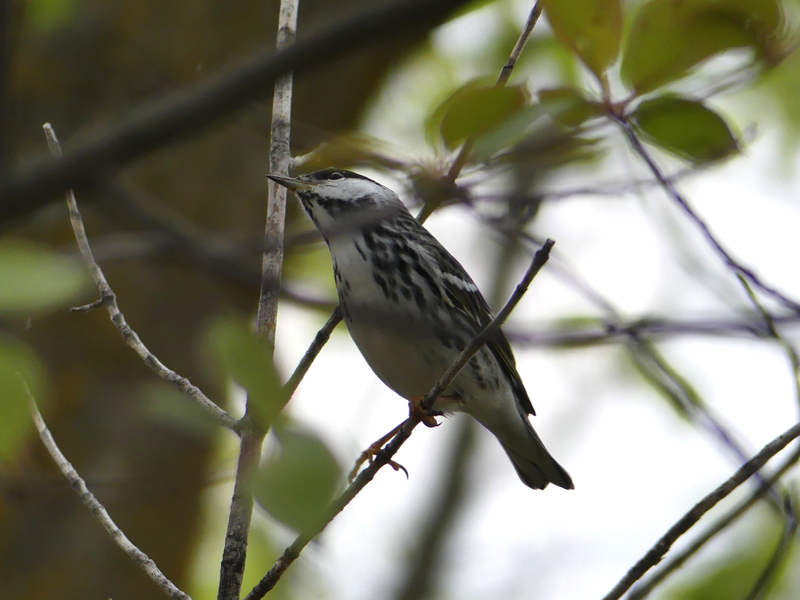 Neotropical migrants, mostly warblers, were everywhere. This was a beautiful spot on the edge of a lake, more like a wonderful park than a typical rest area. I spent an hour there and saw nine species of warblers. It was almost overwhelming, like Magee Marsh without the boardwalk and throngs of birders. My bird list here included American Redstart and Yellow and Blackpoll Warblers. I stopped again at the next rest area, telling myself that one should never pass up a restroom when traveling. But, birds were there, too. Part of me thought that I should move on west rather than ogle these birds that were the same species that I have at home. But then I realized that this was a gift. Magic! And I decided to lean in and embrace the miracle of migration on this beautiful Minnesota morning. 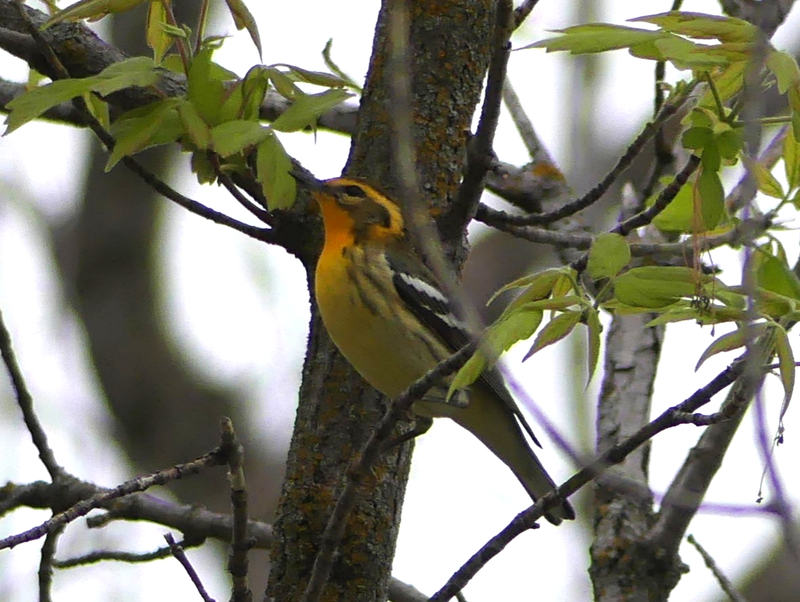 I added Blackburnian, Bay-breasted, and Chestnut-sided Warblers to the morning’s list. The warblers, being warblers, moved quickly and the light was not always favorable for photographs, but my looks were outstanding. 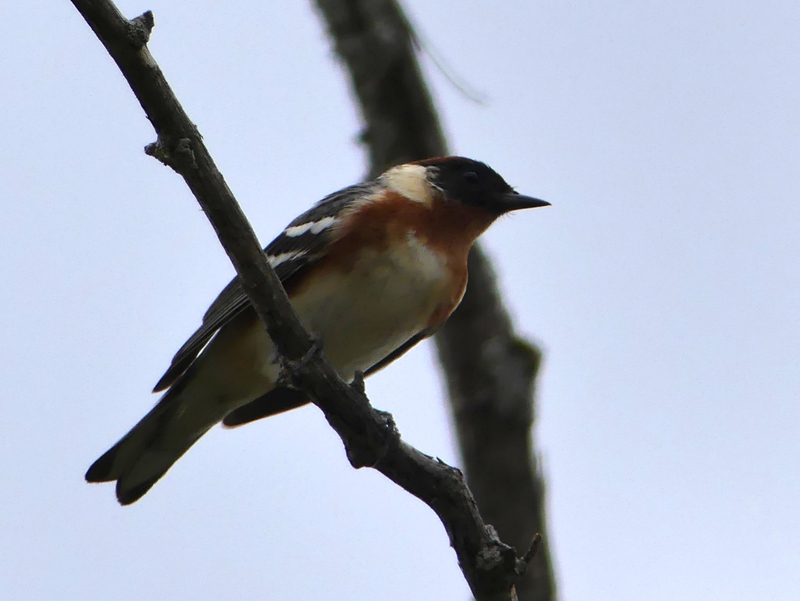 I wondered if I could come to Minnesota every year for migration. After the second Minnesota rest stop, it started raining, and then it became cold and windy when I reached North Dakota. I was happy with my decision to enjoy the birds early in the day as I did not see much to stop for in the afternoon. 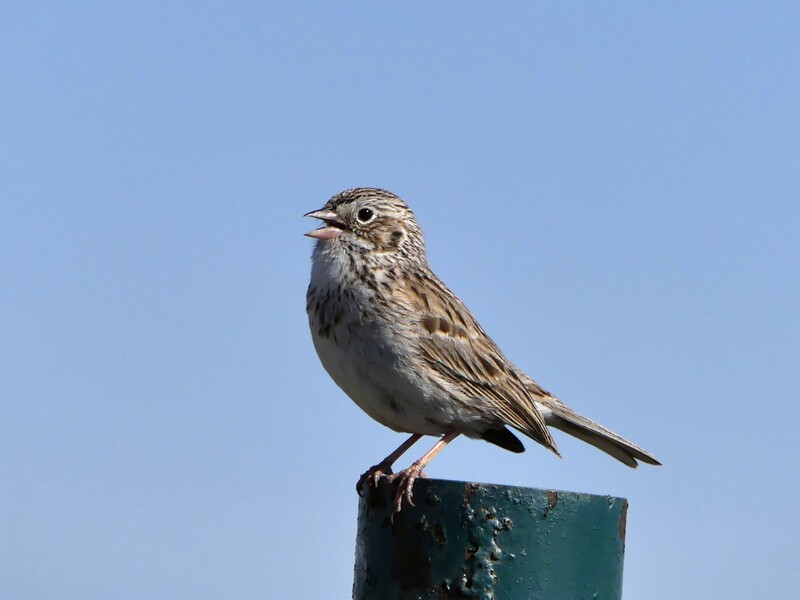 I did find my first western species after crossing the ND state line – a few Lark Sparrows at another rest area. Later, I did a u-turn when I spotted a flock of at least 250 Snow Geese near the road in a field. Tonight I am in Minot, ND. Tomorrow I plan to tour Lostwood NWR and then drive to Montana. 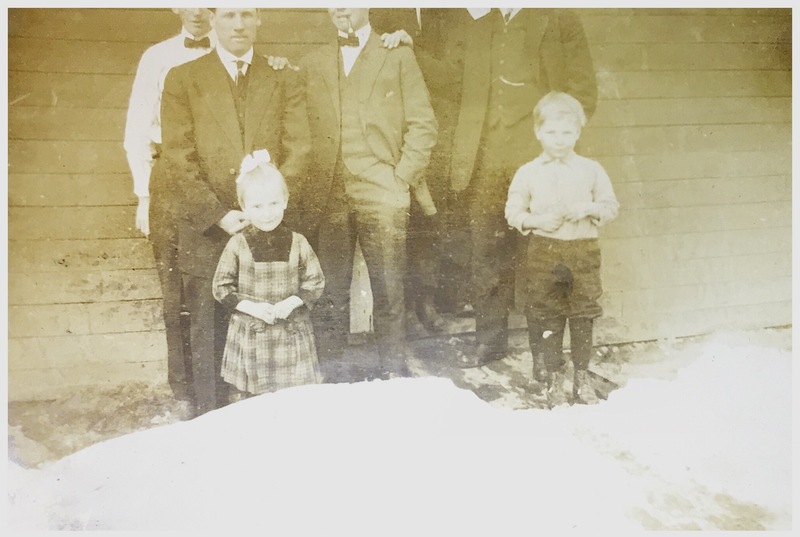 In 1912, Jesse Stantz packed up his young family and left Indiana for Saskatchewan, where he would manage a wheat farm 12 miles west of Swift Current. The family stayed in Canada only five years, but my mother, age three at the time of the move, started school and formed her earliest memories there. It was enough that I have always felt a connection and, like my grandfather, the Canadian prairie called to me. Arrival at the Swift Current train station in 1912. The little girl in the green dress is my mother and the boy is her brother. My mother and I first returned to the place of her childhood in 1988 with my dad and husband. The four of us flew to Winnipeg together, where we rented a car and then spent ten days driving across the plains to Calgary. We were able to find the house where Mom had lived, thanks to her sharp memory and a little land research at the courthouse in Regina. The current owner graciously invited us in to see the house. She said that we missed the one-room school house my mother had attended by only ten years. Our trip ended at the world’s biggest rodeo, the Calgary Stampede, a life-long dream of my mother’s and a lot more fun than I expected. We all loved Canada and had a wonderful time on the trip. Since becoming a birder, I have dreamed of repeating our 1988 trip while stopping to bird along the way. Five years ago I started making inquiries of birders in Canada and playing with various routes and plans. This year I got serious and committed to making the trip happen. As I focused on the life birds that I might find, the route shifted, but the spirit of the trip remained. I would spend a week in Saskatchewan, a couple of days in Alberta, and loop south through Montana on my way home. I left home yesterday morning, May 16, and after two full days of driving over 1300 miles I am in Grand Rapids, Minnesota tonight. So far my only birding has been at rest stops and last night’s motel, but I find it interesting to see the changes in common bird species as I drive from state to state. 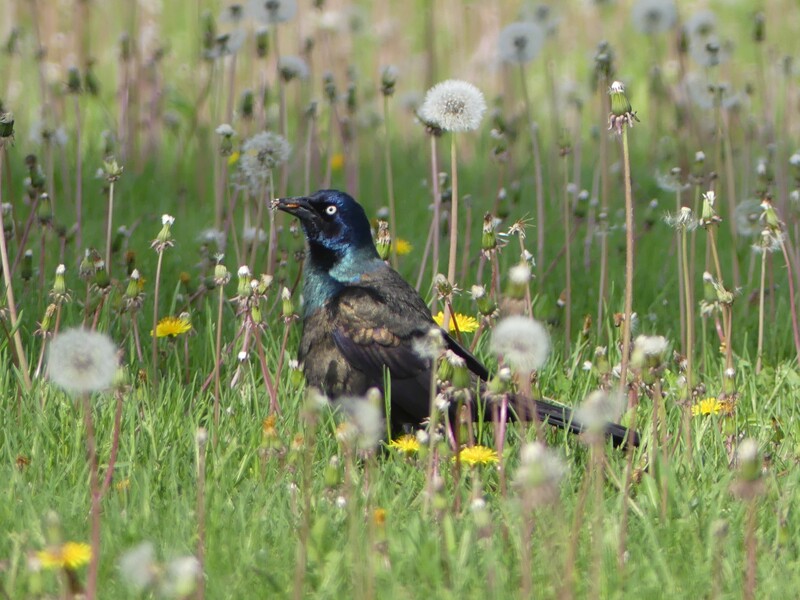 Red-winged Blackbirds and Common Grackles where numerous in the farm states of Indiana and Illinois. 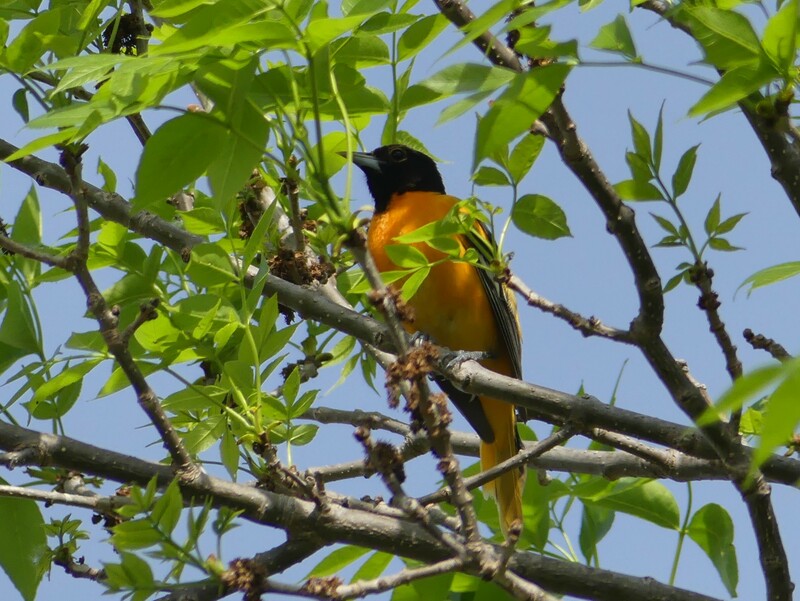 In Wisconsin, I found Baltimore Orioles at every rest stop. 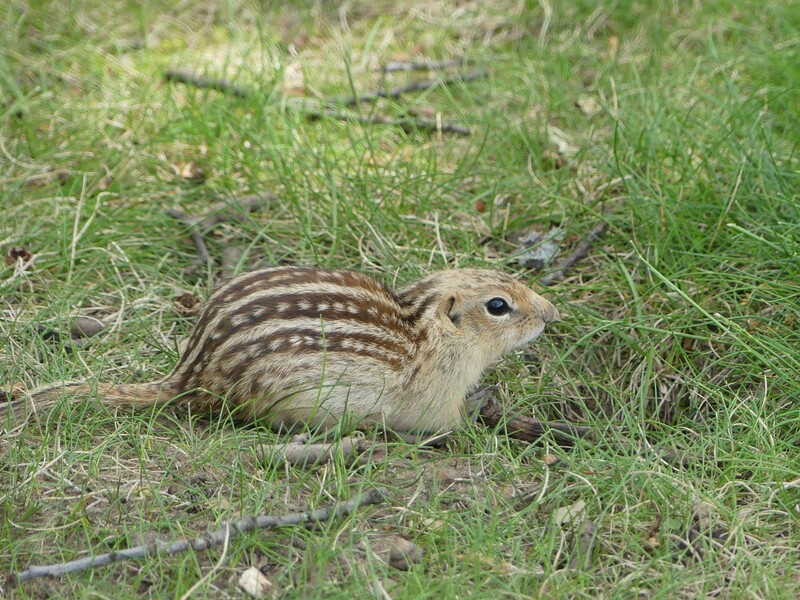 I also found a cute little chipmunk in Wisconsin. If anyone can identify it, please leave a comment on this post. Tomorrow will be a little easier as I will drive the two-lane US-2 through Minnesota and North Dakota. The following day I will get to Montana and begin the search for my first target bird, Mountain Plover. Will I find the plover and other birds my heart desires? Stay tuned.